Bates is both a former University of Arizona track star and football player. He was voted the Pac-10's most outstanding male performer at the conference track championships in 1989 and 1990, winning the 100- and 200-meter dashes. He was also a member of the Wildcats 400-meter relay team that finished second in the 1989 NCAA Championships. In the 1992 Barcelona Olympics, his time of 20.38 from the inside lane, put him 0.37 seconds behind gold medal winner. 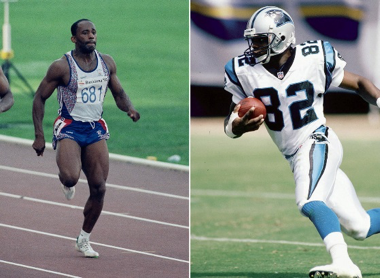 In addition to his track accomplishments, he was also a kick returner in the NFL teams from 1993 to 2003.